Passionate and trusted wine and food pairing specialist professional. A talented chef Sommelier, international wine and food judge, educator/lecturer. 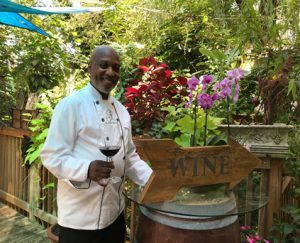 Tony’s journey started around home, the restaurants and wineries of Maryland. From Vocational cooking school, a full scholarship to Widener University Hotel/Restaurant earned BS degree and interned/at the Hotel Krone Assmannshausen Rudesheim, Germany. He was in the first graduation class CIA Pro-chef program in 1998 at Culinary Institute of America Greystone Napa, CA. In 2010, he became a Napa Valley Certified Wine Educator. Tony has attended 10 years at Napa Vintner Wine Writer Symposiums and Napa Premiere Events, and one year as a featured speaker. He has been a member and lecturer with Society of Wine Educators American Wine Society, German Wine Society, Tasters Guild Society, Vancouver Playhouse International Wine & Food Festival, The Annual Zinfandel Festival, The Lodi Lake Zinfandel Wine Festival and Pennsylvania Wine Festival. Lawrence was appointed to the Pennsylvania Wine and Spirit Advisory Counsel [PLCB] in 2010 and still presides on the counsel. Tony spends a great deal traveling monthly to the west and a regular judge at 12 annual wine competitions, such as, the San Francisco Chronicle, Sonoma Harvest, Florida International Fine Wines and other national, international, state and local competitions. The Global Winechef has over 45 years in the Hospitality Industry, corporate catering, motion picture or private catering, Philadelphia Eagles, NFL Films. He was the executive chef at two major clubs in Pennsylvania; the Germantown Cricket Club and Merion Golf Club. Tony is a philanthropist to a few charities & events such a Eat Your Heart Out in Philadelphia, Hiller Aviation Museum -San Francisco Area and served as a board president for a charter high school in Philadelphia for 10 years. He is an international wine collector and gardener. One of his hobbies is traveling, studying DNA of the worlds vineyards and food farming research. Tony loves entertaining and planning wine tastings dinners, thinking inside and outside the box.